Based on the true story of chess prodigy Bobby Fischer, PAWN SACRIFICE is a calculated portrait of the legend both on and off the chessboard. Bobby Fischer was a chess super star – a rare breed if there ever was one. He achieved celebrity status in 1972, widely considered to be the best player of all time even today. The movie begins with a young Bobby, living in Brooklyn. He was a natural from the beginning. Just a young boy, he sat in his room playing chess against himself. Bobby played so much and so intently, that his mother took him to a psychiatrist. And that was the foundation for Bobby’s life. As Bobby’s skills grew from local competition, to national, to global, so did his neuroses. The movie portrays his extreme paranoia and emotional instabilities, deftly played by Toby Maguire (SPIDER-MAN). This personal story – or more like, struggle – is the guts of PAWN SACRIFICE. Watching him act out, throw tantrums, insult his closest confidants, and pledge his allegiance to anti-communist and anti-Jewish conspiracy theories. His family was Jewish, by the way. Bobby’s mentor on the worldwide circuit, Father Bill Lombardy, described it best in the movie when he said that chess is a “rabbit hole” – there are more chess moves than there are stars in the galaxy, he described. So then, with a one-track mind focused solely on the game and the strategy, Bobby could not possibly lead a normal life. It was not his destiny. His life would only be chess. But in the midst of the Cold War, some people saw his destiny as an opportunity. The United States and the Soviet Union were at odds, and the U.S. was desperate to show superiority. And that’s where Bobby came in. Traditionally, the best chess players in the world were Russian. But with Bobby, America had a chance to beat them at their own game. When Bobby announced his retirement in a fit of rage, suddenly an American lawyer took him in with ties to the White House. The lawyer, played by Michael Stuhlbarg (A SERIOUS MAN, HUGO), manages to get Bobby back on the chess circuit. Stuhlbarg is a joy to watch. He also recruits a mentor to help Bobby - Father Bill Lombardy played by Peter Sarsgaard (JARHEAD, FLIGHTPLAN). Father Lombardy is one of very few chess players who ever beat Bobby, and is therefore one of very few people who Bobby respects. Sarsgaard is a delight, the most relatable and genuine character in the movie. Most of the story revolves around the main trio – the chess player, the lawyer, and the priest. It’s a fun dynamic and the closeup on their relationship brings the real life story down to a personal level for the viewer. Because it is based on the true life story, the movie is fairly straightforward. 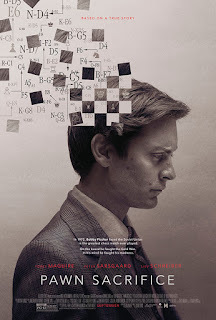 The tension and the drama comes from Bobby’s anxiety (he feels he is being constantly spied on, and that the Soviets are out to destroy him), and from the chess competitions. Bobby’s chess career reaches a climax when he faces the number one player in the world for the title of World Champion, Boris Spassky played by Liev Schreiber (X-MEN, SCREAM). The chess drama is enough to keep an audience’s attention. The patriotic tension riding on Bobby’s success raises the stakes. Wonderful performances from the whole cast make PAWN SACRIFICE a pleasure. Director Edward Zwick (also the director of BLOOD DIAMOND and LEGENDS OF THE FALL) was able to bring an epic American story to the screen. There were some pieces that felt unfinished though. For example, flashbacks and asides where Bobby is being investigated by the government as a potential communist, or dynamics within his family that never really produce any real payoff. And the musical score seemed inferior to the rest of the craftsmanship in this movie. And, while the movie was clearly covering a certain time period leading up to Bobby’s championship match, the story stops abruptly leaving the audience with just a summary of Bobby’s life after chess. Bobby fell into obscurity after his glory days. The movie glossed over what seemed like a fascinating and tragic story at the end of his life, and it felt like a tease.